See you at our 2018 events! ISA’s Governance Boot Camp supports the capacity of public sector institutions to develop effective governance mechanisms and deliver breakthrough results. It features keynote sessions, workshops, and peer exchanges facilitated by governance practitioners with real-world experience in managing the Performance Governance System (PGS). The upcoming boot camp will be held at Bai Hotel Cebu in Mandaue City, with the Basic Class scheduled for 20-23 February and the Master Class scheduled for 26-28 February. Participants are encouraged to reserve their slots early. The Skills Lab is a series of standalone workshops that transfers specific skill sets needed to run the Technical Working Group (TWG) or Office for Strategy Management (OSM). 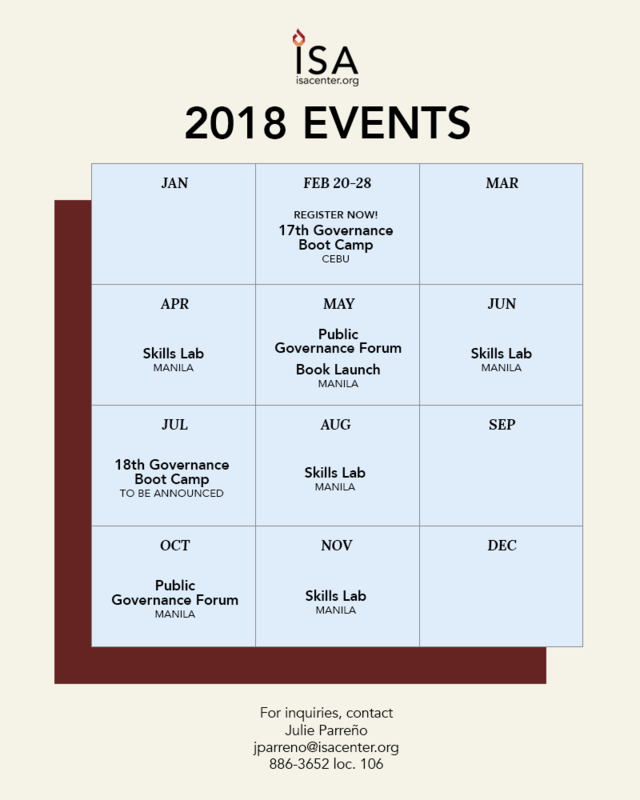 After two successful runs with international policy advocacy expert Camelia Bulat and risk management expert Michael Gallego, ISA is preparing four more workshops for 2018. The Public Governance Forum gathers 400 members of government, business, civil society, youth, media, and the academe to discuss governance reform and explore its link to national competitiveness, long-term development, and true nationhood, presenting as case studies public sector institutions who are transforming themselves through PGS. As part of ISA’s governance reform program, heads of these institutions are required to deliver impact reports to a multi-sector panel in public revalidas before they are officially recognized for their achievements in the same event. One of ISA’s most anticipated events is the yearly launch of a new work by its Founder and Chairman Emeritus, Jess Estanislao. Since 2016, ISA has been giving it as a fundraising gift for a simple campaign to enlist civic support for its governance programs. After launching two books—It Can Be Done in 2016 and Beyond Change in 2017—the Institute has gifted around 1,700 books to Filipinos living here and abroad who have pledged their support for the Dream Philippines.